Andy Ditzler wants to make one thing clear: He is not a Buddhist, but he has logged some hours at the local Zen center experimenting with Shamballic meditation. Though talk of Buddhist philosophy sneaks into his debut recording, Songs from Yes and No, it comes less from his personal faith than it does from planting his secular tongue firmly in his cheek. "A lot of these songs come from the point of view of someone who goes to the Zen center and has that first experience of checking things out and screwing everything up," says Ditzler. "Am I doing this right? Is this how I'm supposed to sit? Why does my back hurt? It's taking the confused person that I was and making it into a comic persona." 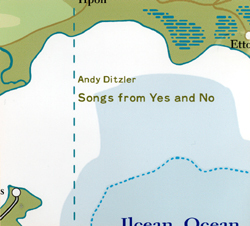 Songs from Yes and No was born from a stage production Ditzler created for Clayton State University in the spring of 2002. At the time, he was writing and performing in children's theater pieces as well as standard shows for the college. Ditzler was eventually commissioned by the theater director, Larry Corse, to put together a performance for CSU's regular theater season. That April, he unveiled his work under the title Yes and No. "I put together a two-act show - I called it a one-man show but I had a band on stage," says Ditzler. "I had video going and I had monologues and regular songs that all played off of each other on stage. I think of it as a performance art musical." After CSU's season ended, the material from the show clung to his psyche, nagging to take on a life of its own. Ditzler began rearranging the monologues to function as song lyrics. Over the course of three years, he refined the material, worked out the kinks and shaped songs that stood independently of their original stage form. The resulting collection of songs consists of clear and logical pop numbers and repeating musical phrases that weave together to form a concept album steeped in naiveté and a quest for enlightenment. Ditzler's innocent voice ambles with wide-eyed wonder, pondering politics, spirituality, economics and technology. In opener "Another Customer," he struggles with the amplified human condition that's inherent in a culture driven by mass communication, where being left waiting on the hold line becomes a private hell. "Just the Six of Us" is a stream of consciousness stroll through Ditzler's brain, where parents and grade school teachers step in and out of the fold. Grand and crystalline piano arrangements intertwine with striking horn blasts, at once evoking everyone from Scott Walker to Vandyke Parks, balancing a breezy sense of existential quandary. Dozens of local musicians' names appear in the credits to each song. For live performances, he has assembled a band, consisting of Keith Leslie (drums), Colin Bragg (guitar), Robby Handley (bass), Brian Parks (keyboards), Blake Williams (trombone) and Kebbi Williams (saxophone), all under the direction of Ditzler's upfront and elementary observations. Like an album composed by the unrestrained voice in your head, songs like "Economics" ask questions like "Why do all television stations play commercials at the same time?" Poetic ruminations, such as "Microsoft made Windows to look like Mac, just like Apple," and "Coke bought Minute Maid and now lemonade tastes like Snapple," are contemplative musings that are both humorous and harrowing. "A lot of these songs came from the experience of sitting in meditation where you deal with the thoughts in your head," he says. "One of the first things I found out when I started doing this was how much talk is going on up here," he admits as he taps the side of his head with his index finger. "There is so much rushing chatter up there all the time. After you sit for a while, some of that parses out and you view your thoughts more objectively. That's definitely a big part of all of this."